Solution 1: The charger is built in sturdy connector with TPU protective hook, which the watch won't fall off or connect well with the charger. [Package Included] Epuly 1 X Fitbit Versa charger (smart watch & wall adapter not Included); 1 X Warranty Card; ONLY work for 2018 Fitbit Versa, not for Fitbit fitness tracker. [Upgraded design] With edge cutting design, the watch can connect precisely with the charger, no restrictions with any type of band when charging. 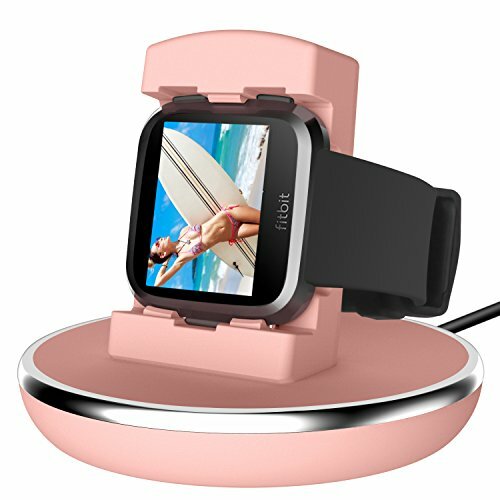 [Premium Quality] Made of durable pc material, sturdy connector with TPU protective hook holds your Fitbit Versa securely, no fall off/connect badly when charging. [Scratch-Free & Non-Slip] Soft TPU on the hooks provide your Fitbit Versa with a safe cushion, which protects it from scratches and an Non-slip silicone pad on the base stops the Fitbit Versa stand from sliding and keep your desk or nightstand free from scuffs.